I think we all know how I am going to answer this question. YES. A big resounding yes! I do realize that a lot of our supporters and fans enjoy looking at our work and we love you for doing so! But for us watermarking is a way of keeping our designs safe. If you are a professional baker I recommend you do the same. There are some nasty bakers out there that have stolen our photos and have used them on their sites to promote their work. This happens a lot, not only to us, but to many of our colleagues as well. The watermark we put on our photos are light so you can still see the detail, but we put enough of a mark on there to protect our work. If there is any advice that we can give to our baker friends it is this: protect yourself and your brand, watermark you photos!!! Obviously the picture on the left is a little obnoxious with the watermark. We do have a watermark on the right photo, but light enough so you can still enjoy the details. Absolutely agree with watermarking photos. 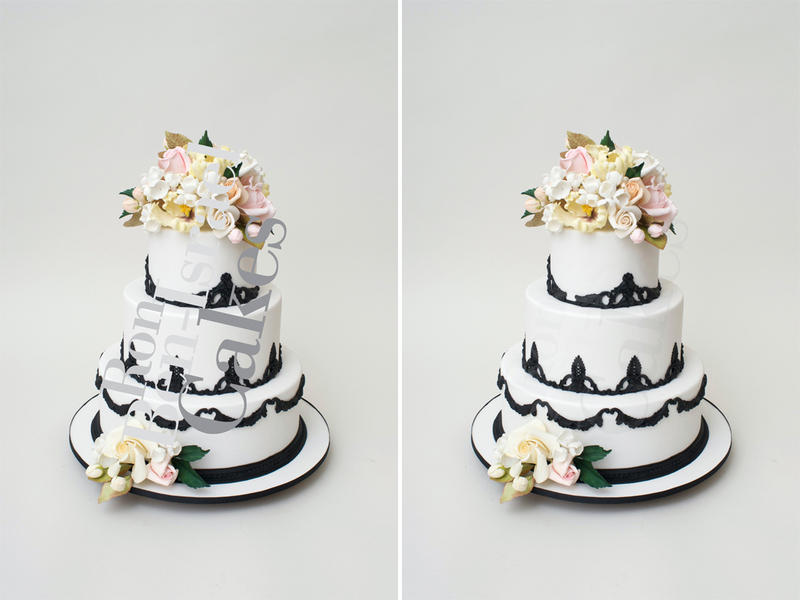 We have had to fight to get cakes removed from 3 websites (with the watermark on them)! From CA to TX & that’s only the one’s we’ve found out about! The watermark is so light on the second photo that it took me awhile to actually see it! That’s a good thing. You’re right, it doesn’t interfere with the photo. Fantastic cake BTW! I agree completely. With photos being copied and pasted everywhere these days online, watermarking a photo is a must. And, it doesn’t have to detract from the beauty of the photo. I think it can make the photo look more professional.